I bought one of Annabelle’s magic white pumpkins on her recommendation. She said they were the best for pie. I always believe her. 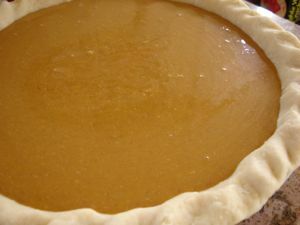 Even though I never make pumpkin pie (I always have the Thanksgiving guests bring it so I can concentrate on the savories) I thought I might as well give it a whirl. I cut into it and I couldn’t believe the otherworldly day-glo quality of the flesh. And the beautiful line of pale green between white and orange. I couldn’t stop gazing. But into the oven it went in a glass casserole dish with a half-inch of water, covered in foil. I baked it until soft (about 30 minutes). It looked stringy but I scooped it into the food processor and gave it a whirl and it became a flawlessly smooth puree. Then I made pie from the Jimtown Store Cookbook. It’s a wonderfully robust pie, not at all insipid. 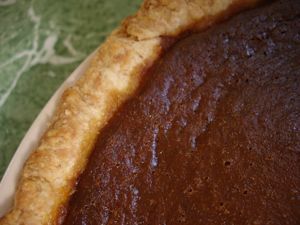 Filled with dark brown sugar, molasses and spices, including black pepper. Fantastic! Then I froze some of the puree until this week and decided to make pumpkin bread. I’ve never made pumpkin bread before either, but I’ve eaten a lot of it. I like the kind with a cream cheese layer, so I Iooked around for recipes and found this one. 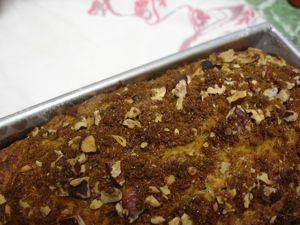 But I wanted the quality of my bread to be robust, like the pie, so I made the recipe my own by adding more spices, molasses, dark brown sugar and a pecan streusel on top. It turned out great. Preheat the oven to 350 degrees F and toast the pecans for 5 minutes. Set aside to cool. Meanwhile, melt the butter and set it aside to cool. Butter and lightly flour two 9 x 5 x 3 inch loaf pans. Set aside. 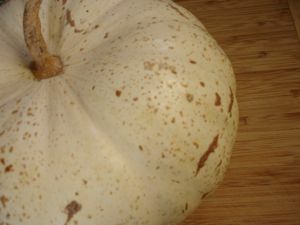 In a large bowl, whisk together the flour, baking powder, baking soda, salt, cinnamon, nutmeg, allspice, and black pepper. Set aside. In another large bowl, whisk the eggs until lightly beaten. Add the granulated sugar, 3/4 cup of the brown sugar, and melted butter and whisk until blended. 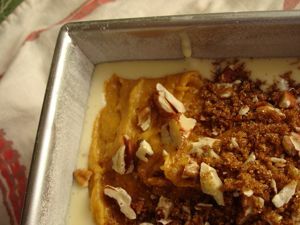 Whisk or stir in the pumpkin puree, molasses, and vanilla extract. In a food processor, process the cream cheese until smooth, add the sugar and process until blended and smooth. Add the eggs one at a time, processing just until incorporated, stopping to scrape down the sides of the bowl with a spatula. Add the flour and vanilla extract and process briefly. 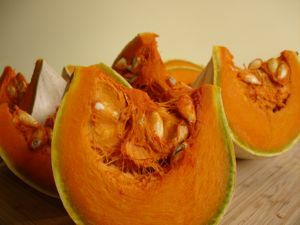 Add the flour/spice mixture to the pumpkin mixture and stir just until the ingredients are combined, without overmixing. 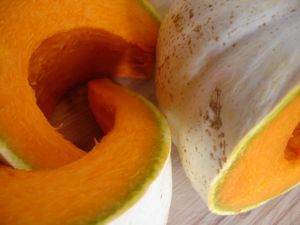 Put one-quarter of the pumpkin batter into the two loaf pans, spreading it evenly. Top each one with one-half of the cream cheese filling. Top the cream cheese with the remaining pumpkin batter. Chop the nuts coarsely and toss with the remaining 1/4 cup brown sugar. Sprinkle evenly over the top of each loaf pan. Bake the breads for about 60-80 minutes, or until a toothpick inserted into the center of the loaf comes out clean. Place pans on a wire rack and let cool for about 10 minutes before removing breads. Give one away and keep one! Or freeze one. This entry was posted in breads and pizzas, breakfast, from the market, holidays. Bookmark the permalink. Post a comment or leave a trackback: Trackback URL.